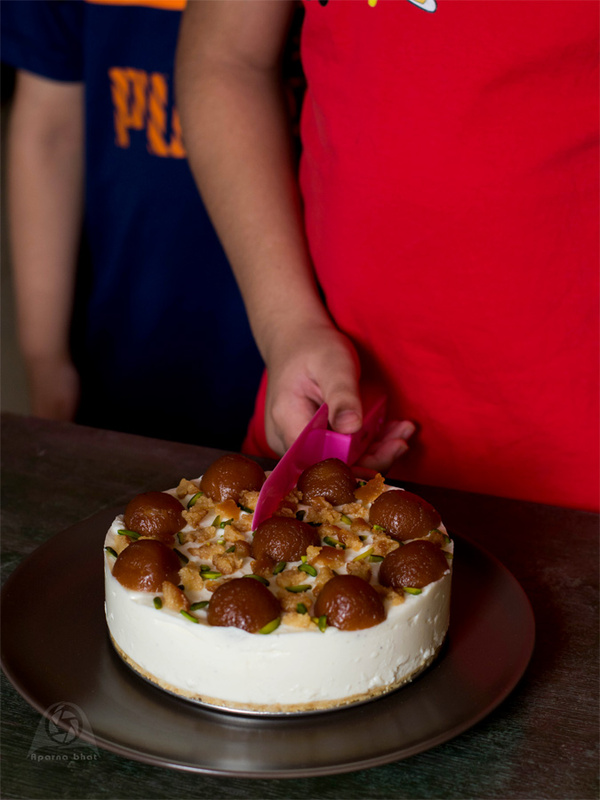 Our family being Gulab Jamun lovers, my kids just love this Eggless Gulab Jamun Mix cake and always prefer it at each family celebration. 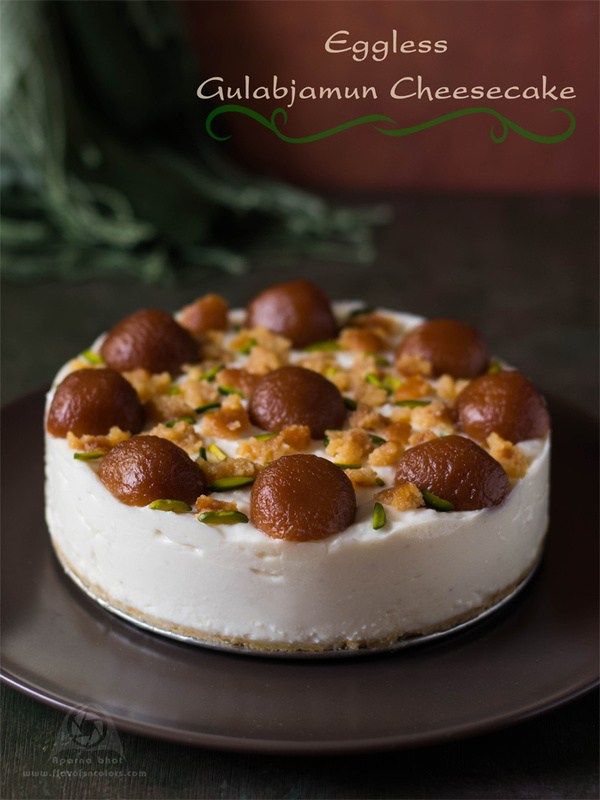 So when the time came to think about some desserts for elder one's birthday celebration, his answer obviously was "Gulab Jamun Cake". Keeping his preference in mind, I went ahead and prepared this western cheesecake dessert with a desi spin. Inspired from Sanjeev Kapoor's recipe, this cake is eggless made with agar agar. All you have to do is whip the ingredients together, pour into the springform pan, place it in the fridge and wait for couple of hours or overnight. The best thing is you don't need any oven to make this cake and still this delicious cheesecake will make you look like a baking expert! Take 6 inch springform pan and line it with parchment paper. Keep it aside. Powder the biscuits. (I used food processor. You may put the biscuits in zip-lock bag and use rolling pin to crush the biscuits). Now add melted butter and blend well until the mixture comes together. Place this mixture in the springform pan and spread it evenly. With the help of your palm or back of the spoon/ drinking glass press it firmly. Cover the pan with cling film and refrigerate the mixture for 30 minutes. Alternately you can use individual glasses for serving. Divide the biscuit mixture into equal portions and press it at the base of these glasses. Now proceed to prepare the filling. Mix hung curd/yoghurt, cottage cheese, condensed milk, milk, saffron, cardamom powder in a blender and blend it well until smooth. Pour the curd cheese mixture into a bowl and keep aside. After 30 mins remove the pan from the fridge. 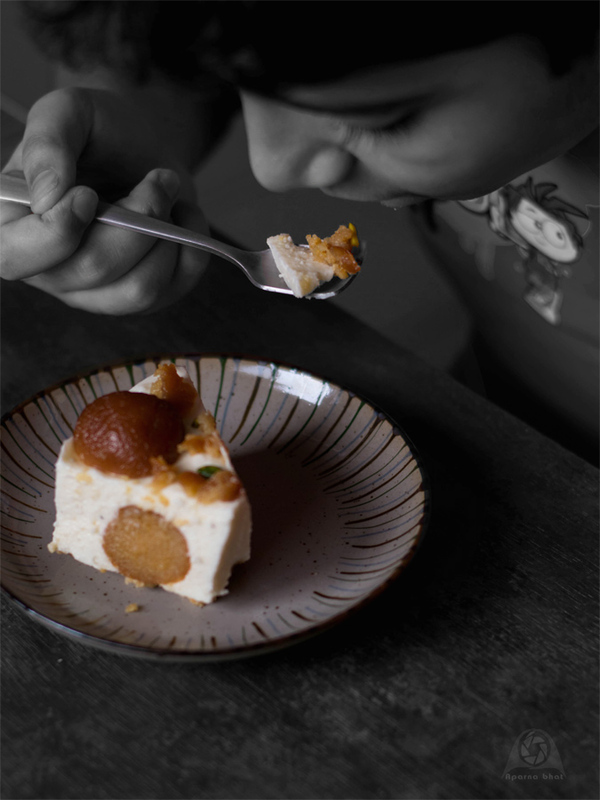 Place gulab jamun pieces [either full pieces or cut into halves] on the biscuit layer leaving some gaps in between. Prepare agar agar solution as per the packet instructions. Soak 10 grams agar agar in water for 10 minutes and after 10 mins drain the water. Heat 1 cup of water and add soaked agar agar into it. Keep stirring continuously on sim flame for 3-4 minutes. Switch off the flame and keep it aside. Allow it to cool down for a minute and then pour the agar agar solution gradually into curd cheese mixture. 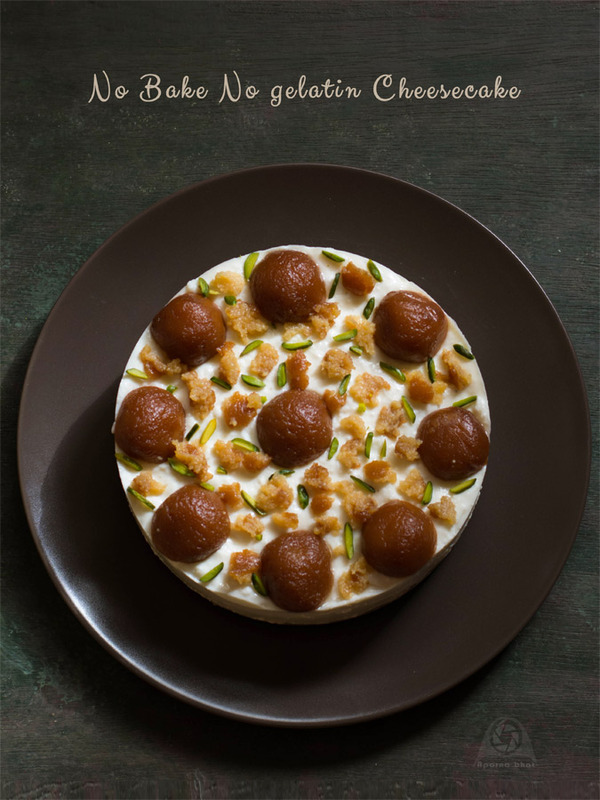 Whisk it swiftly and pour it over the gulab jamun layer. Tap the pan lightly, spread it evenly and smoothen the surface with back of a spoon. Garnish the surface with cut jamun pieces and chopped pistas. Cover the pan with cling film and refrigerate it until completely set. At the time of serving, unmould the cake from the pan. Slice and serve. Enjoy the rocking jugalbandi created by this delicious fusion cheesecake! Family loved it and it was great to watch birthday boy eating this cake with relish! You may increase the sweetness by adding castor sugar while blending the curd cheese mixture.